Astronomers have apparently witnessed a collision between two neutron stars. This collision apparently produced gold, worth about $10 octillion (109). But before you jump in your car to go and collect some of this bounty, you need to know that this collision occurred 130 million light years away. The discovery, such as it is, was reported by a number of news agencies in October 2017. What are we to make of such reports? As with all evolutionary or deep-time articles, we have to read between the lines. Behind the reports are the astronomers’ presuppositions. According to Big Bang philosophies, the original matter in the universe would have to have been hydrogen. This hydrogen would have to aggregate, by gravity waves, until it could start undergoing nuclear fusion. This would gradually produce slightly heavier elements. Later gravitational collapse would cause supernovae, and the clouds of dust which these caused would aggregate again into second- and third-generation stars, providing ever heavier elements. Finally, super-dense stars, called neutron stars, would be produced. 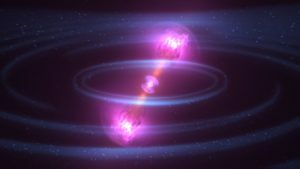 The very heavy elements, such as gold and platinum, would require the collision of two of these neutron stars in order to create them. So you see that the presuppositions of how heavy elements could form by themselves were in place before the discovery was reported. What the astronomers actually saw was a complex object whose light included the absorption spectrum for gold. It is therefore somewhat disingenuous to claim, as they do, that “we see the gold being formed”. Instead of using Big Bang theory to interpret the observations, creationist astronomers – who presuppose the Bible – will soon suggest better explanations of these observations. Prayer: When we look at the heavens, Lord God, we consider that we do not know why You are mindful of us, but we are thankful that You are. Amen. Ref: Astronomers strike gold, witness massive cosmic collision, < http://www.foxnews.com/science/2017/10/17/astronomers-strike-gold-witness-massive-cosmic-collision.html >, accessed 12/21/2017. Image: Public Domain (NASA).